This was a time of fidelity to, and blind faith in, its own characteristic charism; and also a time of synthesis of the most valuable aspects of the Recollect spirituality. Its first concern was for the organisation of the Religious life. A few months after disembarking in Manila, the Missionaries founded the convent of Bagumbayan (1606) and in the following years they did likewise in San Nicolás (1609: the mother house of the Province), Cavite (1616), Cebu (1621) and San Sebastián (1621) situated on the outskirts of Manila. The Philippine islands: Regions evangelised by the Augustinian Recollects. Nevertheless, the Recollects had not abandoned the Spanish convents to shut themselves away again. In September of 1606 they took charge of Mariveles, a missionary post not far from Manila. I remember it here for having inaugurated the centenary of the missionary history of the Order. From this missionary post they advanced towards the North through the Province of Zambales and Pangasinán. 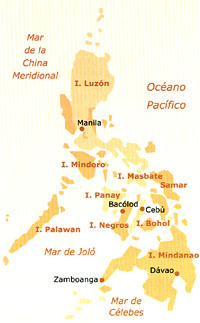 In 1622 they assumed the administration of Mindanao and Palawan; and years later they associated themselves with the epic missionary achievement that the Philippine Church was carrying out in Japan (1623-1635): moreover, they extended themselves throughout the islands of Negros (1626-1635), Romblón (1635-1933), Mindoro (1679-1936) and Masbate (1687-1791). A simple glance at the map will show that it fell to the Recollects to evangelise the most remote and inhospitable regions of the archipelago; and also the regions most exposed to the Moorish raids. Between 1606 and 1776 no fewer than 45 Religious succumbed at the hands of both Moors and mutinous natives. A couple of dozen others perished in this same period by falling victim to shipwreck, hunger, jail and other miseries. These circumstances conditioned their work, surrounding it in a certain militaristic air. The frequency of the Moorish incursions and the destitution in which their fellow Christians were living, obliged them to personally assume responsibility for their defence. This they achieved by constructing small forts in the most strategic points. Others of their most notable characteristics were their regard for the contemplative vocation of the Order, and their insertion into the life of the community.